As we continue to make changes and engage with you about ways to improve the American Board of Internal Medicine’s (ABIM) Maintenance of Certification (MOC) program, our process of collecting and listening to your thoughts and comments has evolved. I appreciate the e-mails, phone calls and letters. Your personal stories, ideas, viewpoints and criticisms are what we need to hear to make sure our program is relevant to what you do in daily practice and affirms and reflects the pride physicians take in staying current in their field. Following up directly with physicians through one-on-one conversations and individual correspondence has expanded my perspective to include not just my own experiences as a practicing physician, but also physician experiences from across various backgrounds, practice settings, locations and specialties. A nephrologist in New Jersey expressed that some MOC requirements are difficult for small practices to complete. Along those lines, an internist from South Carolina told me about the disparity in the use of technology in health care and how that can impact the MOC process. An internist from Virginia shared with me earlier this year that for the first time, he was considering whether or not to recertify, noting it was difficult to keep up with the amount of knowledge required to pass the exam and that he favored ABIM accepting more high-quality CME. A nephrologist from Oklahoma told me ABIM’s MOC program can be a way to drive people to do more high-quality CME. A cardiologist from Massachusetts said that a trusted colleague might not be a top performer on assessments, but may go above and beyond for a patient – indeed, something we agreed was important but difficult to measure or reward. An internist from Ohio shared the satisfaction he feels after passing an exam, but also noted that the field of internal medicine has become diverse, suggesting an updated recertification process would be helpful. A practicing pulmonologist in Missouri said that he used to like MOC, but that the changes announced in 2014 felt like a waste of time. Like many of the physicians with whom I’ve spoken recently, this doctor had collected input from his colleagues before our conversation in the hopes of making MOC more meaningful. Another internist from Ohio told me that ABIM’s decision to accept more CME that might be more relevant to his practice for MOC credit was excellent news. He also shared some conditions he sees regularly in his practice that he would like more lifelong learning activities to address. 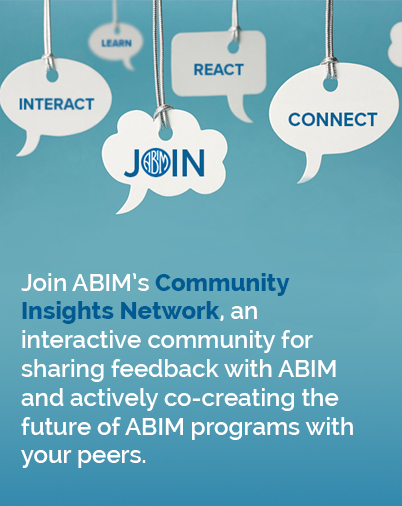 These valuable conversations—combined with input from the broader internal medicine community—have already led to changes: ABIM has partnered with ACCME to accept about 700 more CME activities for MOC credit, and we are also working with you to create assessments that are more meaningful and less burdensome by exploring ideas presented in the Assessment 2020 report . Open, ongoing dialogue will continue to move us forward, together. Community engagement is now an integral part of our work process, and the invitation remains open for you to please share your thoughts and feedback with me. Together we will create a credential that captures what we as internists can be proud of.